How can music teachers differentiate their methods for children with Down syndrome? One teacher explains her success and how she encouraged others to take up the challenge. Cross, R. (2003) Teaching children with Down syndrome to play the piano. Down Syndrome News and Update, 3(2), 43-44. The value of parent associations - reflections on 22 years of achievements. This paper is a transcript of the address I gave as guest speaker at the Annual General Meeting of DSA NSW on 25th August 2002 and is reprinted from DSA NSW Newsletter, Spring 2002. The thoughts are not original - they have arisen from many casual, and some very personal, discussions between families and staff over a long period, and they merit explicit acknowledgement in a more formal forum. O’Connor, J. (2003) Taking a longer wider view.... Down Syndrome News and Update, 3(2), 49-52. The significance of hearing loss for children with Down syndrome. Is hearing loss a neglected issue? Is it always properly detected and treated? Buckley, S. (2003) The significance of hearing loss for children with Down syndrome. Down Syndrome News and Update, 3(2), 37-37. Individuals with Down syndrome can also give a presentation! de Graaf, E, and de Graaf, M. (2003) Individuals with Down syndrome can also give a presentation!. Down Syndrome News and Update, 3(2), 46-48. People with Down syndrome tend to have a significantly higher incidence of hearing problems than other groups. This article examines some of the causes and treatments of hearing loss and outlines the assessment process. Sacks, B, and Wood, A. (2003) Hearing disorders in children with Down syndrome. Down Syndrome News and Update, 3(2), 38-41. 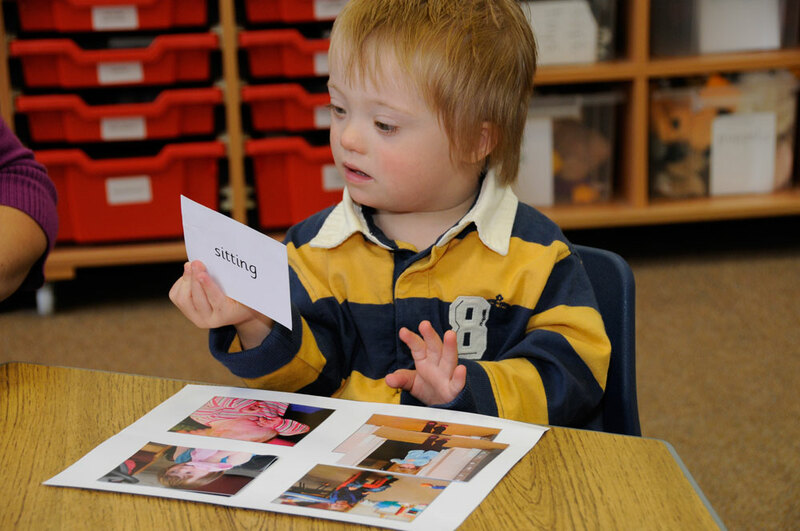 See and Learn Language and Reading is a structured teaching program that is designed to teach children with Down syndrome to talk and to read. The program is evidence-based and easy to use at home and at school. Designed for children with Down syndrome. Available as apps or printed kits.